There are days when I just need an excuse to wear a lot of colors and doing a really bright and colourful fashion photography. Today was such a day when I picked up this boxy bright pink top to wear and all I could think of was teaming it with equally bright mustard orange jeans and more pink! I even wore these mirrored sunglasses with a gradation of many colors and blue nails for extra impact of colors 🙂 This is what I call going all the way the extremes with colourful fashion photography. Less could be more but sometimes more is just fun! 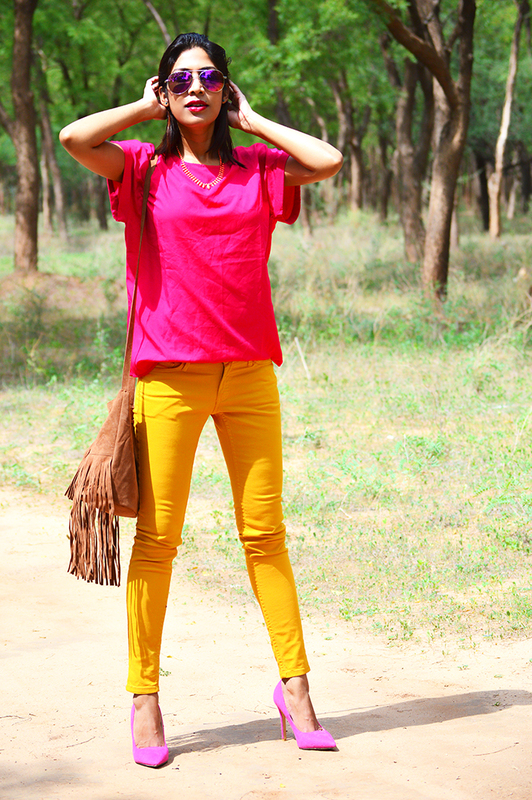 I did manage to grab some attention with all the bright colors and seriously looked like a multi-coloured fashion lover lost in the woods while doing the photo shoot. The bright green background kind of added some extra vibrancy to this already colourful photography. I guess I will keep my write up short today as my photographs are doing all the talking with the overdose of bright colours. It’s like some kind of amazing tropical cocktail in an outfit. Copyrights & copy 2017 @STYLE OVER COFFEE. All Rights Reserved.